Do you know your Retinoids from your Hydroxy Acids? What about the key differences between innovative ingredients like Arnica, Borage, Willow Bark or fruit enzymes? If you can answer yes, you may just be a Skintellectual. 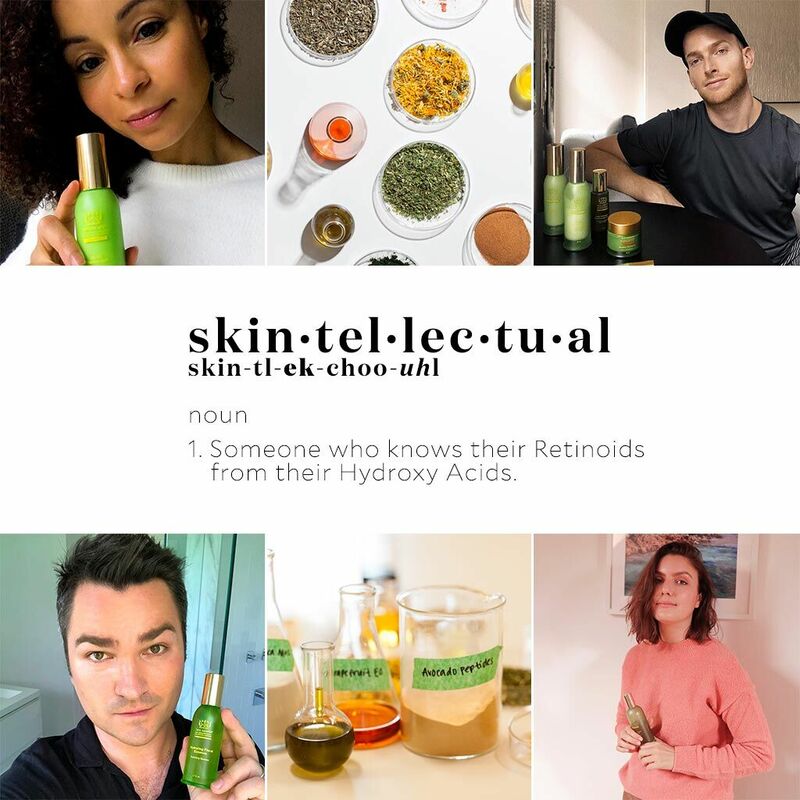 We’re a generation of science-savvy and demanding skincare shoppers who care about health, beauty, and the health of our planet. Fed up with the marketing, gimmicky phrases being thrown around the industry, Skintellectuals want transparency. We want to know the scientific reasons behind WHY the ingredients in our products work, opposed to simply being told that they work. With over 40k followers dedicated to @emmahoareau's curated tips for travel & beauty - we love Emma's savvy skin tips and fresh aesthetic. Q: What Makes You a Skintellectual? A: What makes me a Skintellectual? I’m obsessed with skincare and the ingredients used. Tata Harper was actually the first natural brand I found that I instantly fell in love with because the products don’t have high percentages of essential oils, which can be irritating for sensitive skin. I can’t wait to try more Tata Harper products because I totally trust her brand and the ingredients used are always so incredible - and natural! My favorite ingredients are the enzymes that gently exfoliate to reveal fresh and glowing skin. Q: What are Your Top Picks and Why? A: My absolute favourite Tata Harper product has to be the Resurfacing Mask. I was once told that if I used this once a week I wouldn’t need to wear foundation! It’s now a year later and I can confirm the the texture (and glow!) of my skin has improved drastically and I only need a little concealer under my eyes. So, of course I was really happy when Tata Harper launched their Resurfacing Serum earlier this year - I get the benefits each day and that #dailydoseofglow. Partial to all things face-masks and martinis - we love following along @omgbart's search for the latest and greatest in skincare. A: Skintellectual! Love that term. I’ll be the first to admit that I’m constantly learning from the ever inclusive green beauty community. Since my early interest in skincare, I’ve observed the evolution of the industry influenced by green and natural brands. Personally, I started to pay more attention not only to ingredient decks but also to sourcing practices and packaging. Skincare impacts the environment directly. Green Beauty is so much more than just a trend. A: I consistently gravitate toward tried and true ingredients that have always worked for me — enzymes!! That said, the Regenerating Cleanser is my all time Tata Harper favorite. A couple of pumps applied to dry skin before my morning shower helps invigorate and brighten my complexion. The blend of clay, pomegranate enzymes, and apricot powder address issues like oil overproduction and blackheads. For anyone that follows me on instagram - you know that I cannot pick a favorite mask! However, I do give equal time to both the Clarifying Mask and the Resurfacing Mask unapologetically. Some days, I jump start the morning with a quick double exfoliation with the Clarifying Mask (in replacement for Regenerating Cleanser because too much exfoliation is a thing) for an instant glow. With over 317k followers, @scoutthecity may just be our favorite (chic!) mommy blogger. Inspiring women to be confident, fab, and totally transparent in beauty & family content. A: Natural skincare is important to me because I want to know that I’m not only doing what’s right for my skin, but also for the environment. The next generation of beauty is here and so is the information we need to keep our skin healthy and toxin free . That said, I’m totally obsessed with natural ingredients like Calendula, and was thrilled to see this flower extract added to Tata Harper’s Beautifying Oil. I love this ingredient and often use it on my son’s skin during the colder months when his skin becomes dry. It can also be used as an anti-inflammatory, to heal diaper rash or eczema. A: The Rejuvenating Serum is a must for me! Signs of aging are always a concern of mine and this serum not only targets those problem areas but also gives me a firmer, healthier looking appearance. The Restorative Eye Crème is also in heavy rotation in my AM and PM routine. As a working mom, I often have under eye bags that leave me with a tired look. This eye cream not only brightens but gives the appearance that I am well rested. An online destination for the discerning man, we love @mressentialist's top tips on skincare essentials. A: I’m a huge proponent of natural skincare and promoting sustainable grooming products. More and more men are focusing on developing their own custom skincare routines to solve any concerns they may have. The best part about my job is helping them learn what works best, and how various products can be used to maximize effect. I'm a big fan of Tata Harper because I can trust her ingredients to be clean and super effective. A: I love the Clarifying Moisturizer because it’s so soothing and easy to apply. I’m prone to stress-related breakouts and this moisturizer really helps keep things clear. I’ve also recently discovered the Retinoic Nutrient Face Oil and have quickly added it to my winter skincare essentials. It’s so rich and absorbs with ease.